"Click" on the pictures for a larger view Update: As of 01/26/2005, all #1405 Rev.4 Full Kits will include Irrgang Racing, polished aluminum lowered pod plates. The plates feature a ride height lowered by .090 thousandths, which lets you use your racing tires at a much smaller diameter, saving you money in tire costs, and increasing on track performance with lower rotating mass, and less side-wall flex. 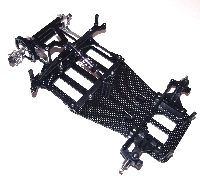 Super narrow dedicated 4-cell racing chassis. No rubbing or drag on the carpet equals more speed, run-time, and better handling for you. IRS Aluminum Pod Plate Set. 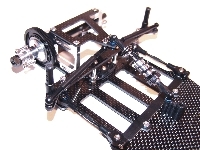 90 thousandths lower ride height, super strong, easy motor access, and perfect axle/bearing alignment. Shortest front overhang. Much better on bumpy tracks. Keeps the front tires in contact with the carpet. 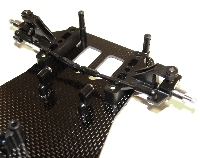 Ultra rigid carbon fiber chassis. We buy the very best graphite on the market. All chassis are not created equal. Give your current one a twist and see for yourself. New Large Pro D-Ring Axle and Hubs. Again....the very best axle/hubs on the market. Using standard mini electronics, the Rev.4 comes in under R.O.A.R. minimum weight out of the box. 18 National Titles and still counting. 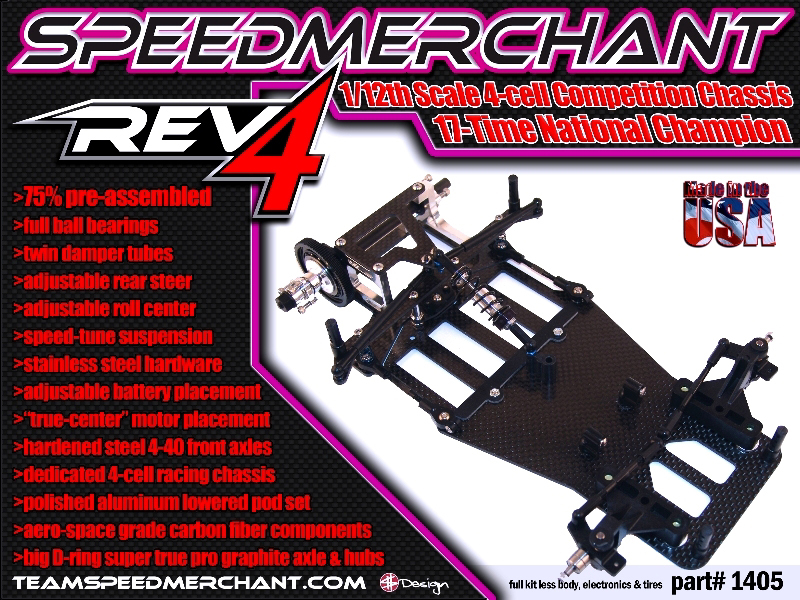 Look for a Rev.4 in the winner's circle near you. Note: In it's very first race, SpeedMerchant's Jake Pritchard TQ'd round 3 of this year's R.O.A.R. Modified On-Road Carpet Nationals. Let's hear what Jake has to say about the new Rev.4. "The new car is just awesome. I honestly didn't see how we could make a car much better than my Rev.3, but the Rev.4 truly is. The difference in the narrow chassis is really quite remarkable. Not only did I gain run-time and top speed, but the car actually has more front and rear traction". "At the Nats, I had insane horsepower with my Fantom motors and SMC batteries, but I was able to drive my Rev.4 just flat-out strapped. I couldn't believe the amount of traction I had exiting corners. Usually, in modified you have to roll on the power very slow as you exit a corner. With the new car, I literally was able to punch it corner to corner. On top of that, the track was really kind of bumpy, and my Rev.4 was easily the smoothest car on the track. It tracked perfectly straight through a lot of the sections where the other guy's cars were getting bounced around. To be able to put a new car down, and TQ a round at the R.O.A.R. Nationals, over Associated's and Trinity's best was unreal. I can't wait for this upcoming season". Thanks Jake....we appreciate your hard work and dedication.